Educational apps rank ninth among all app categories in terms of downloads. 17 per cent of mobile media users download them – a third of the number downloading games (54 per cent), for example. Whilst their popularity might be described as niche, their impact is transformative. To acknowledge the benefit that mobile education is having on consumers, MEF has included a new mobile education category in this year’s Meffy Awards – the global awards for mobile content and commerce. The award highlights the innovation and impact mobile has on education resources and services and celebrates the mobile apps and services developed to improve access, efficiency and flexibility that mLearning presents. There’s more info on this Meffy category here and below we’ve outlined some of the finding of MEF’s recent global study on mobile in education. Earlier this year MEF published its third report in its Global Consumer Insights Series on mobile education, mapping mobile education trends across 13 countries (10,000 respondents took part). 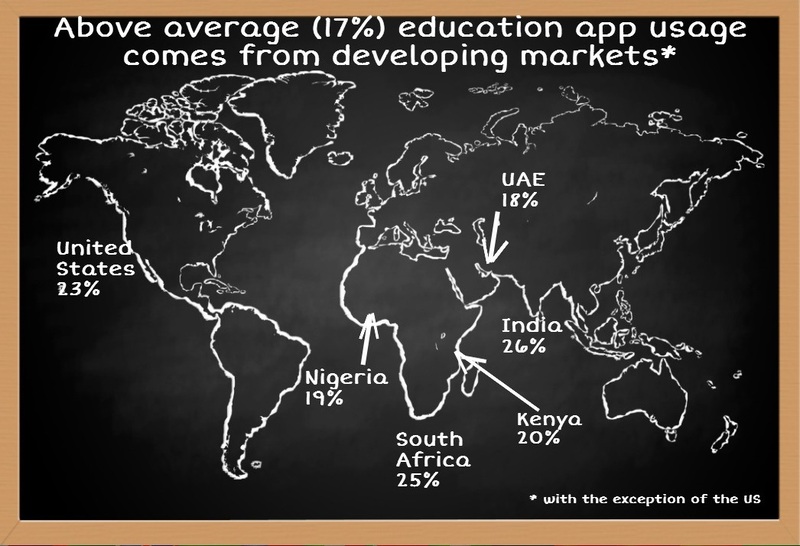 The standout conclusion was that the greatest enthusiasm for educational apps comes from mobile media users in developing countries. Of the five countries exceeding the average rate of downloads in the sector – India, South Africa, US, Kenya and Nigeria – only one (US) can be described as a mature market. As an example of how mobile and mobile education is taking hold, it’s widely reported that there are now more mobile phones in the whole of Africa than there are in the US. In 2001, only about 25 million people in Africa had a mobile phone subscription, but by 2013 that number had grown to 650 million – an increase of 2,600 per cent. Whereas simple handsets are affordable, more sophisticated smartphones are becoming the norm and now available for tens of pounds. By comparison, just ten years ago, computers with similar processing power would have cost thousands of pounds. And mobile phones of course come with a connection to the web. In developing economies alongside other areas like banking and entertainment, there is a very neat fit with mobile education. In fact, the MEF study revealed that it is often the educational authorities in these countries that mandate the use of these apps. But rather than as a boring necessity, respondents top answer when asked what motivated them to buy an education app was entertainment – edutainment. As a subset of the wider mobile industry, the mobile education ecosystem provides opportunities to reach learners of all ages and engage with them in a highly personal, immersive environment. This is happening in growth and mature economies and not just as part of formal education. Insofar as education includes an array of self-improvement and curricular apps that can be used for training employees for example, the mobile education ecosystem is growing, providing a rich seam for education publishers, disruptive app developers and educationalists to forge new markets. There are 16 categories to enter in 2014. Judged by expert panels of international journalists, analysts, academics and VCs, the Meffys provide companies and innovators with an unrivalled opportunity to be considered for the global mobile industry’s top accolades with winners announced at MEF Global Forum 2014 in San Francisco 17th – 19th November.